The Dean of Science and Director of CIAR Meets with Kenyatta University Vice Chancellor. 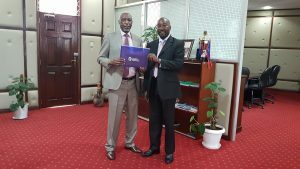 During a recent visit to Kenya, Dr. Patrick Kamau met with the Vice Chancellor of Kenyatta University (KU), Professor Paul Wainaina. Prof. Wainaina did his doctoral work in Education Philosophy at the University of Alberta in early eighties. KU has grown in leaps and bounds with over 60,000 students in ten campuses in 2018 from less than 5000 students when Dr. Kamau was a student there in the late eighties. One of the exciting areas that CUE and KU can have synergy in is collaboration between CUE’s Centre for Innovation and Applied Research (CIAR) with KU’s Chandaria’s Business Incubation and Innovation Centre (CBIIC). Dr. Kamau toured the CBIIC building with the director, Dr. George Kosimbei.